TeachMeet | All Things ICT! 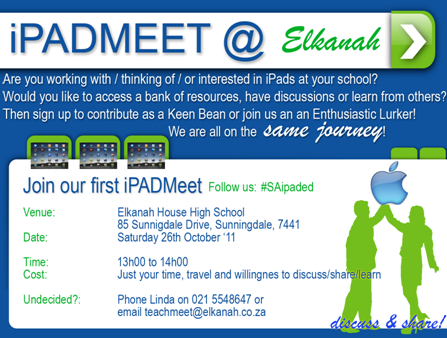 iPADMeet @ Elkanah – Join the conversation! Our iPADMeet will follow directly after our second TeachMeet. For more details go here. Please join us and let’s get the conversation started! Dorian LoveReblogged this on The DigiTeacher. EtreziaI just love your karate blog. Being a karate mom for 11years I can relate. Keep up the good work. A "little" school with a BIG heart!